Our country boasts 59 national parks, and contained within are many lifetimes worth of exploring. Visiting them all is a lofty goal that most people will never achieve, but there are ways to experience many highlights of the national park system in one fell swoop. Some of the most famous jewels are in the Western U.S., which begs the question of how they might be combined in a single, epic trip. Well, here it is. 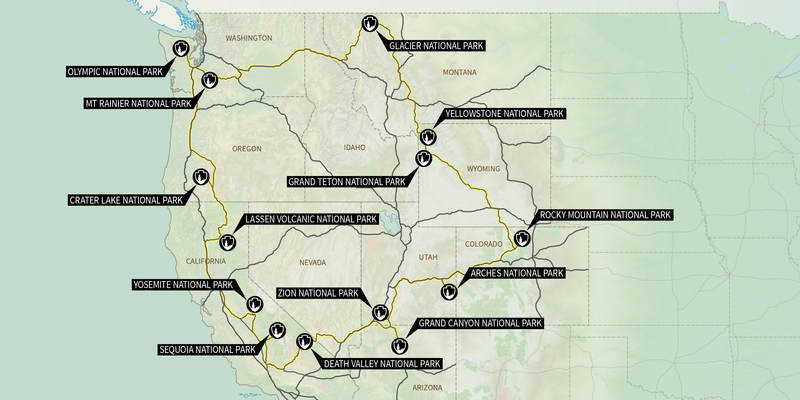 At Outdoor Project, we've put together the Ultimate National Parks Road Trip, combining the "best of the West" national parks in a manageable loop that can be completed during one vacation. The planning for such a journey is a daunting task all on its own, but our detailed guides are here to help. Within this article are links to our complete park overviews and individual destination guides. Use these to discover the highlights of each park and pick out the activities that are right for you. Ready, set, adventure! Gracing the tip of the Northwest is Olympic National Park, a region famous for its fantastic diversity of landscapes and life forms. In this huge expanse of wildness you can explore deserted beaches, misty rainforests, thundering waterfalls, snow-covered peaks, and the limitless surprises hidden in between. Mountains rising dramatically from the shoreline create four distinct environments that rarely exist in such proximity. Within the park, hundreds of miles of roads and trails connect it all, offering an adventure for everyone. For details on everything to do in the Olympics, dive into our complete guide to Olympic National Park. Towering to 14,410 feet, this dormant volcano is the tallest mountain in the Northwest. It's permanently snowy summit crowns a landscape of incredible elevation gradient. In fact, no other mountain in the contiguous 48 States rises so dramatically from the landscape as does Mount Rainier. The park, while not huge in size, offers a bounty of adventures to explore. Scenic day hikes, overnight backpacking trips, riverside camping, glacier trekking, and advanced mountaineering await on the slopes of Rainier. Discover it all with our guide to Mount Rainier National Park. Glacier National Park. Photo by Shane Kucera. Continuing eastward and out of Washington, a long but worthwhile drive leads to the "Crown of the Continent," Glacier National Park. You'll see icy pinnacles extending in every direction from Logan Pass on Going-to-the-Sun Road. More eyefuls unfold while hiking the Highline Trail, to Garden Wall, or to Hidden Lake, and you can camp among glacial lakes and herds of mountain goats at Granite Park, Sperry Chalet (note that a wildfire consumed the chalet in 2017), Bowman Lake, or Cobalt Lake. No other national park has such a high density of glaciers, lakes, and peaks as this aptly named treasure trove. Note: Because of harsh winters and large amounts of snowfall, Glacier's interior is only accessible during summer and fall. 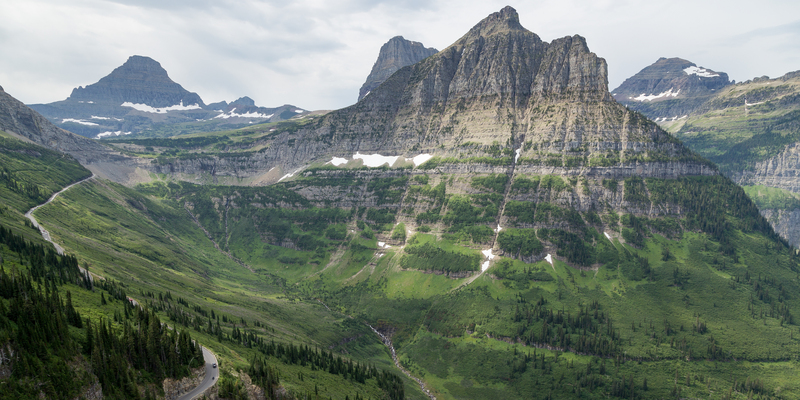 If you will be making a trip when Going-to-the-Sun Road is closed, you will have to access the west and east entrances to the park separately by making a detour south of the park. As a frequent topper on lists of favorite national parks, Yellowstone absolutely deserves a stop on this road trip. Wild herds of bison and elk, colorful hot springs, geysers, and mountains beckon. Encompassing parts of three states, it is among the largest of the national parks. Not surprisingly, there is a wealth of exploring to do, but a chock-full road trip necessitates picking some highlights. Wildlife is abundant throughout the park, and you are likely to see bison near--or even on--the main road through the park. An especially good place for wildlife viewing, however, is the scenic drive through Lamar Valley, where you may spot some of the park's rarer residents like pronghorn antelope, bears, and even wolves. To leave the pavement for an aerobic adventure, try hiking to views in The Hoodoos and on top of Bunsen Peak or Sepulcher Mountain. Near the end of the day, you can find thermal therapy in Boiling River Hot Springs. In the midst of all this, be sure to leave time for classic landmarks like the Liberty Cap, Yellowstone Lake, Mammoth Hot Springs, and of course, Old Faithful. Once passing through Yellowstone, Grand Teton National Park is an easy drive a bit further south. Here, the Teton Range rises to a maximum of 13,775 feet elevation atop the Grand Teton. These are probably the youngest peaks in the Rocky Mountain chain, so they remain especially rugged because they have had less time to be weathered. French explorers were among the first Westerners to see the Tetons, which originally estimated them to be far taller than they actually are due to their impressive prominence over an otherwise flat landscape. Today the Tetons feature fantastic scenic drives, more than 230 miles of hiking trails, camping, backpacking, boating on the Snake River, lake paddling, wildlife watching, fishing, and mountaineering. Rocky Mountain National Park. Photo by Tyson Gillard. If you can tear yourself away from the Tetons, continue southeastward through the mountains to quintessential scenery in Colorado's Rocky Mountain National Park. This alpine wonderland has huge summits as far as the eye can see and a range of activities to suit all abilities, despite its daunting scale and harsh weather. There are easy day hikes, accessible waterfalls, impressive overlooks, developed campgrounds, and wildlife right along park roads. Of course, there are also endless opportunities for long treks, mountaineering, and backcountry camping. 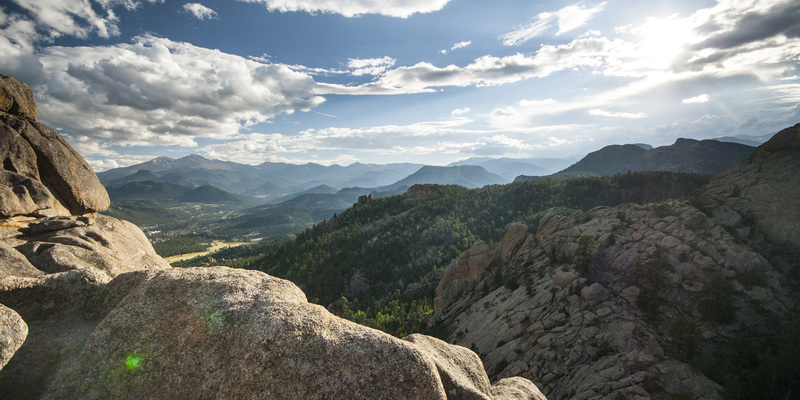 To plan your stay here, check out our guides to the park's best day hikes, camping, and the complete guide to Rocky Mountain National Park. Snowy peaks have dominated the landscape thus far, but the scenery changes dramatically as we descend into the deserts. An eye-popping drive across Colorado's Western Slope gives way to the slickrock country and sandstone cliffs of Utah, where Arches National Park awaits. This is a relatively small park, but it is packed full of iconic landmarks and rewarding hikes like Delicate Arch, Broken Arch, Devil's Garden, Windows Arches, and the Fiery Furnace. Mormon pioneers named this area after a biblical metaphor for the city of God, and the comparison is quickly realized once you enter this monumental canyon. The greater landscape is comprised of uplifted sandstone domes that are reminiscent of prehistoric sand dunes now frozen in time. Water and wind have furrowed the surface into a maze of wide gorges, slot canyons, and towering cliffs that are best explored by venturing off the pavement. Adventures include easy day hikes, exposed cliff traverses, non-technical canyon hikes, technical descents, and multi-day treks. The Narrows and Angel's Landing are popular bucket-list hikes, and our guide to Zion National Park covers many other must-see destinations in the park. Grand Canyon National Park. Photo by Denis LeBlanc. As the West's most visited national park and a relatively short drive from Zion, Grand Canyon is an obvious choice for the next destination. With well over 5 million visitor per year, however, crowds are the main deterrent to enjoying views of the world's most dramatic canyon. The good news is that this ultimate itinerary leads to the far less crowded North Rim, rather than the South Rim which gets nearly 90% of the traffic. Views from the North Rim are even more spectacular, but it is harder to access from most directions and only open for part of the year. If you are visiting between October 15 and May 15, you will have no choice but to make the long drive around to the South Rim to get into the park. The North Rim's higher elevation (more than 9,000 feet in some places) means harsher winters and snowbound roads. During the rest of the year, however, it stays breezy and cool, allowing for pleasant strolls along numerous rim trails like Widforss, Bright Angel Point, Transept, Ken Patrick, Point Imperial, and Cape Final. 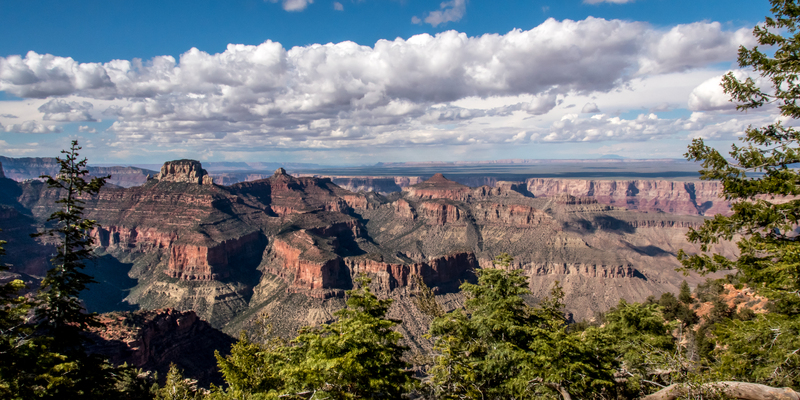 For those looking to take on the rigors of hiking into the canyon, there is the North Kaibab Trail which reaches the Colorado River at the bottom and connects with South Kaibab and Bright Angel Trails. Venturing into the canyon requires proper preparation and permits for camping. For spending the night above the rim, luxurious lodging is available at the Grand Canyon Lodge and more rustic camping at North Rim Campground. Our tour of desert parks culminates with the hottest and driest of them all: Death Valley. It is here that you can stand at the lowest elevation anywhere in North America, at -282 feet in Badwater Basin. An all-around record breaker, Death Valley is also the largest national park in the contiguous United States. There is far more to do on this seemingly desolate landscape than most people realize, but many parts of the park are hard to access because of road conditions and brutal heat for much of the year. For example, only long, rough roads reach the mysterious sailing stones of The Racetrack. Still, there are classic destinations that are easy to reach, like historic Scotty's Castle, Devil's Golf Course, and the Mesquite Sand Dunes. Check out the full guide to Death Valley to round out your trip and find what's right for you. The journey now rounds a corner northward to trend back toward the Northwest, but the fun is far from over. A drive alongside the Southern Sierra leads to Sequoia National Park, home of the largest trees on earth. Though Redwoods grow to be taller, Giant Sequoias can be wider and more massive overall. The General Sherman Tree in this park is the largest single living body on the planet. Far more than just a grove of giant trees, Sequoia National Park also holds many scenic drives, spectacular hikes, waterfalls, and campgrounds tucked away in the rugged landscape of the Sierra. Together with adjacent Kings Canyon National Park, there are far more adventure opportunities than time could ever allow. Use our consolidated Westslope Itinerary to get ideas for planning your stay. Note: Winter weather can cause road closures within and around the park, so be prepared for last-minute re-routing if you'll be visiting between November and April. Tunnel View in Yosemite National Park. Photo by Tyson Gillard. Finally, we've arrived. Another frequent favorite, Yosemite's granite grandeur is not to be missed. This high-elevation glacial valley boasts some of the most impressive scenery anywhere. Huge cliffs like Half Dome and El Capitan are some of the most-photographed rock formations in the world, and along with these come majestic, massive waterfalls. The road in Yosemite Valley leads through the heart of it all, and you can take in some of the park's most incredible sights by hardly leaving your car. A landscape of this scale has far more to offer, however. Challenging hikes, committing rock climbs, and treks into the remote backcountry are there for the adventurous and able. 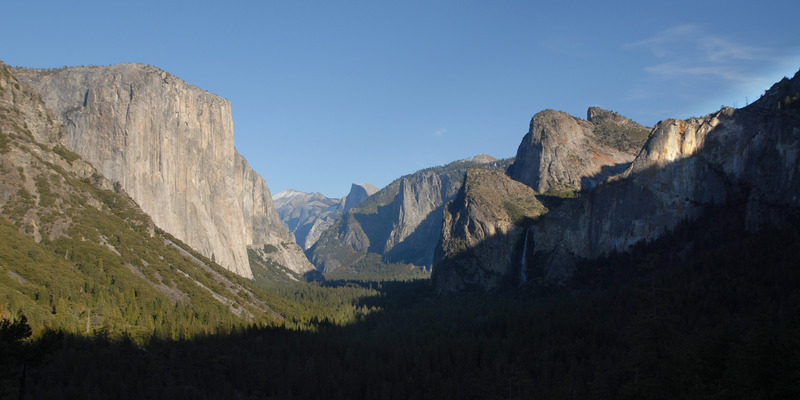 Explore it all with our guide to Yosemite National Park, which summarizes the distinct areas of the park and breaks down the best activities in each. Note: Roads leading to Yosemite sometimes close for snow. Be prepared for winter road conditions and closures from November to April. Next on the list is a park often overlooked. This is a shame, because it holds a truly remarkable landscape and some interesting history. The 10,457-foot Lassen Peak is the southernmost active volcano in the Cascade Range, and one of the snowiest. It most recently erupted in 1917, and it was the biggest volcanic event recorded in the U.S. until Mount St. Helens blew in 1980. Today, the area around Lassen is still alive with geothermal activity. Sulphur springs, steaming creeks, mud pots, and boiling pools are reminiscent of those in Yellowstone, but they occur here in even greater concentration. Many of these features can be easily accessed via paved paths and boardwalks during any time of year, while others are more remote. Additional park attractions include alpine lakes, summit hikes, waterfalls, and lava tubes. The park offers something for every season, but certain parts are inaccessible during winter except by skiing or snowshoeing. To plan your trip and learn about summer vs. winter experiences, check out our guide to Lassen Volcanic National Park. 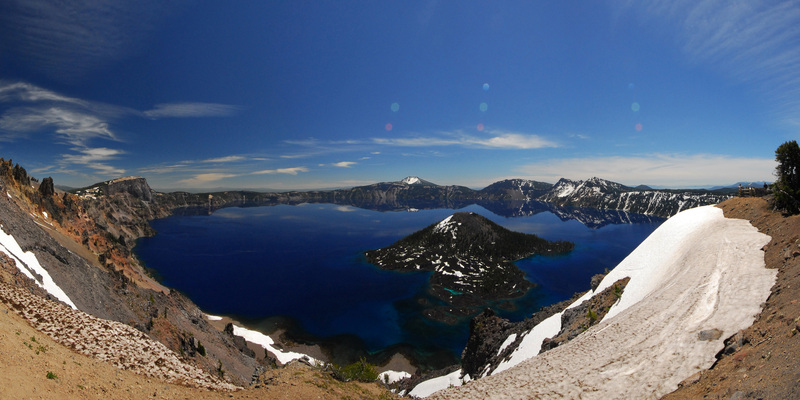 Crater Lake panorama. Photo by Tyson Gillard. Our ultimate road trip culminates with another famous showcase of Cascade volcanism--Crater Lake. Oregon's only national park boasts the nation's deepest lake and the bluest water you may ever see. Rain and snowmelt have filled in a 5-mile-wide crater left by a massive eruption over 7,000 years ago. The main attraction at Crater Lake is hiking along the rim and feeling the frigid water in the lake. Boat tours are available as well. There are also other opportunities for recreation like camping, backpacking, and skiing/snowshoeing. Roads to the rim are not usually open to cars in winter. Use our guide to Crater Lake National Park to discover all the things to do and when to go. This completes our Ultimate National Parks Road Trip. It is possible to pack the best of the Western parks into a two to three week journey, though it involves a lot of driving and non-stop action. Of course the entire endeavor is not feasible for everyone, but this list should still serve to inspire some form of adventure and add at least a destination or two for your next road trip. Hi: Outdoor Project is great! We (fam of five, husband and 19, 16, 11 yr olds) have 14 days in july to make the best road trip we can that includes as a minimum San Francisco, Yosemite, Grand Canyon, and Yellowstone... We would appreciate so much for OP to recommend some of the best routes for achieving this and adding other of the great parks in your amazing list to the road trip. Thanks in advance! Hey! Awesome post! When do you think it would be best to start this trip so you don't get too cold in Yellowstone or get burned in Death Valley? How much time do you think it takes to do it if you take your time on the road and in each national park? Thanks! Any thoughts on a 3 weeks trip taking in all of Utah and Colorado's national parks?! I'm greedy and doing Utah's might five doesn't just seem enough (!) - crazy for time specified?